The Spring Market is upon us! With the warm weather brings eager buyers ready to find their dream homes. If you are thinking of selling this season and need to prepare your house with repairs, check out this hack to make it a little easier for you. 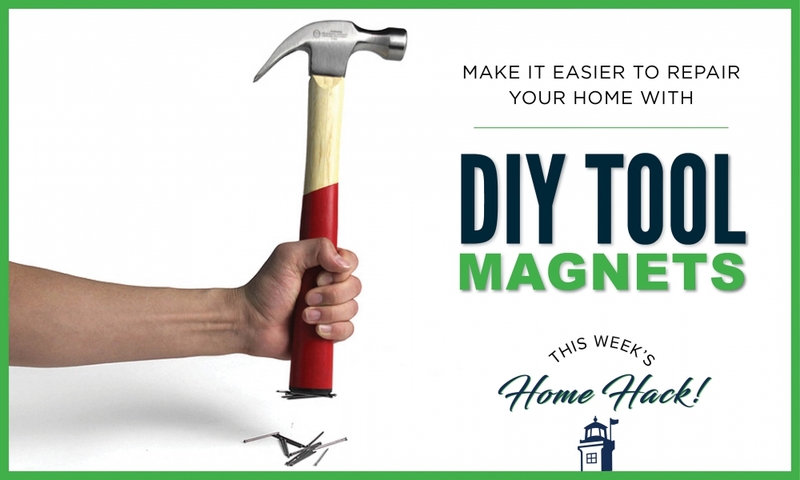 Magnets are great for many different home hacks, including tool hacks! For example, if you need to use a hammer, say goodbye to dangerously holding nails in your mouth or dropping and losing them. Glue a magnet strip to the bottom of your hammer and that will hold your nails for you. It will make your life easier when using your hammer. Another great magnet hack for your tools is using a magnet strip as a tool holder. Glue a strong magnet strip where you store your tools and hang your tools on this strip. This will free up space on your workbench or shed. One last great DIY magnet hack for your tools involves mason jars. This is a great hack if you have a work room, garage, or shed. Glue a magnet strip to the ceiling or underneath your work bench. Then, glue a magnet strip to the top of a mason jar lid. Then you can use the mason jars as holders for your nails, screws, or any small tool items. Close the jars and put them on the magnet strips. All these hacks will make doing repairs a little more easier and a little more fun!